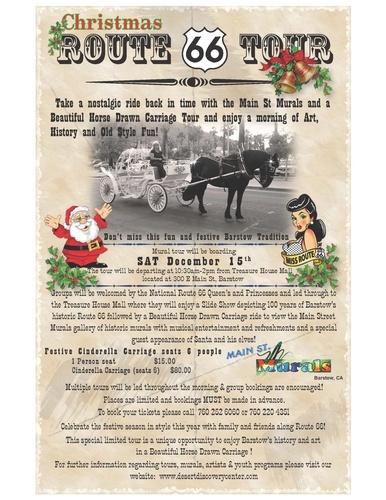 Groups will be welcomed by the National Route 66 Queen's and Princesses and led to the Treasure House Mall where they will enjoy a Slide Show depicting 100 years of Barstow's historic Route 66 followed by a Beautiful Horse Drawn Carriage ride to view the Main Street Murals gallery of historic muralss with musical entertainment and refreshments and a special guest appearance of Santa and his elves! The tour will be departing at 10:30am to 2:00pm from Treasure House Mall. Multiple tours will be held throughout the morning & group bookings are encouraged.